Loosefill insulation, also called “blown-in” insulation, is made of virgin PINK fiberglass insulation. It’s used in new construction and in older existing homes, typically in hard-to-reach areas. Since fiber glass insulation is non-combustible and non-corrosive by nature, PINK fiberglass loosefill insulation offers significant advantages over other loosefill insulation products. ProCat allows for more R-value in tight or small spaces. It will not settle or lose its energy-saving abilities over time as many other products in the market do. It does not require the addition of harmful fire-retardant chemicals that can promote corrosion of pipes or wires because it is naturally fire resistant. It will not rot or decay, support fungus or mold growth, or provide sustenance for insects or vermin. It is naturally mold and mildew resistant. ProCat™ Expanding Blown-In PINK FIBERGLAS™ Insulation releases and expands completely inside the machine. 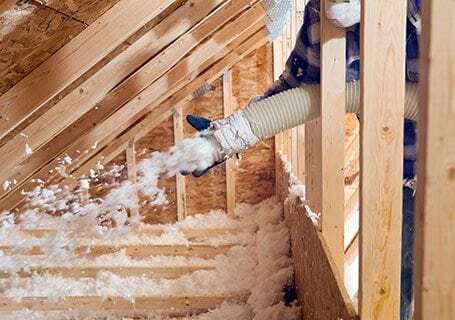 As the insulation bounces its way up to your attic, it is further conditioned through the length of the hose, breaking it up and fluffing it, creating millions of tiny air pockets that give the material its insulating power. We leave your home as clean as it was when our crew arrived. ProCat™ Expanding Blown-In PINK FIBERGLAS™ insulation will not settle. Keeps its energy saving R-value overtime and limited life time warranty against settling or losing R-value. ProCat™ Expanding Blown-In PINK FIBERGLAS™ Insulation is naturally non-combustible and meets all building codes for non-combustibility without the use of chemicals. Non-corrosive. Doesn’t require fire-retardant chemicals which can leak out cause corrosion of pipes, electrical equipment or structural metal attachments. Naturally moisture resistant. Moisture reduces insulation effectiveness. Glass fibers resist moisture build-up. ProCat™ Expanding Blown-In PINK FIBERGLAS™ Insulation works on the principle of trapped air pockets. Tiny air pockets trapped in the insulation resist the passage of heat flow—heat loss in winter and heat gain in summer. Generally, the thicker the insulation, the more air pockets and the greater the insulating power. ProCat™ Insulation is a great option for your arsenal of energy efficient housing ideas! A revolutionary new type of multilayer reflective insulation, eShield™, is unlike any radiant barrier product on the market today. As opposed to radiant barrier products, eShield™ has a center core composed of high-density fiberglass and is true insulation that has the capability to reflect 97 percent of radiant heat transfer. eShield™ is simply more effective at lowering home energy bills than any radiant barrier product out there. As a retrofit product, eShield™ works in conjunction with existing house insulation, rather than replacing it. In fact, studies have shown that installing one layer of eShield™ may provide more energy savings than adding 5 more inches of fiberglass insulation. eShield™ can be installed in virtually every area of your home, which includes attics, roofs, walls, basements, and more. There are many other factors that help eShield™ stand head-and-shoulders above radiant barrier products. First, eShield™ has a permeability rating of 13, the highest on the market. This means that it won’t cause mildew or other forms of moisture damage. Second, eShield™ has a class A fire rating. Third, eShield™ does not need wire of any kind to hold it in place. Additionally, eShield™ contains no allergens, and it does not let off gases like other insulation products. eShield™ multilayer reflective insulation is based on the same advanced technology and design as a NASA space suit – it reflects radiant heat. In this way, eShield™ is able to protect homes from the sun’s searing rays during summer and retain interior warmth during winter, dramatically reducing energy consumption year-round. The Attic Experts provides attic insulation systems and more to Liberty Township, Cincinnati, Dayton, Hamilton, Beavercreek, Fairfield, Covington, Florence, and surrounding OH and Northern KY communities.